Since the Sony company produces televisions using both active and passive technologies for creating 3D images and the glasses used have several series and types. Consider how manufacturers label their points, all the points are the first three letters signify that the product TDG glasses, followed by the designation of a series of points. C 2010, the following series of 3D glasses made. TDG-BR750 - used in TVs HX Series, NX, EX, using an active technology to create 3D images, they do not differ much weight only 34 grams, the use of infrared light to synchronize glasses with the TV. Equipped with a nickel-hydride rechargeable battery, the operating time of about 15 hours, the battery is charging glasses from the USB connector of the TV. TDG-BR250, TDG-BR200 - used also in TV series HX, NX, EX, active technology have a weight of about 60 grams, with a rechargeable Lithium Ion battery, operating time of about 30 hours, it is provided by the USB charging. TDG-BR100 и TDG-BR50 - basically the same, only the earlier model glasses the weight of 77 grams. 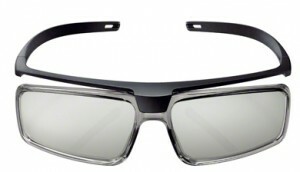 TDG-BT500А and TDG-BT400А This glasses to an active technology of creating 3D images. Feature active glasses lightweight 36 grams, the use of a lithium battery, and the application to synchronize with TV Bluetooth. 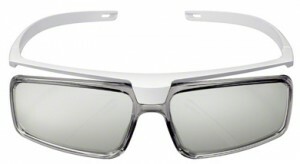 Models such glasses are used with TVs in 2013 W9 series. Points also support SimulView ™ technology. TDG-500P - are passive glasses used in W8, X9 series for viewing 3D video. No power required. It can be worn over ordinary glasses. TDG-SV5P - passive glasses weigh 16 grams, used for playing games on the television is a passive technology that support SimulView ™ technology. Can be used with models W8 TV, X9. Briefly about SimulView ™ technology - use the opportunity to demonstrate 3D TV screen, one player is shown the picture for the left eye and one for the right. As a result, each player sees only his image but on a full screen. Points come in pairs one pair of glasses for one player to the other the second. That is, in some glasses two glasses for the left eye, and secondly, to the right. Connectshare ™ (USB 2.0) Movie What is this?